The Drogheda Brass Band was formed in 1886 as the Colonel Leonard Fife and Drum Band, named after a local man who was a colonel in the Union Army in the American Civil War and became involved in the Fenian movement. In the early 1900s the band purchased the instruments of the disbanded Band of the Leinster Regiment of the British Army and became the Drogheda Brass and Reed Band. This formation remained until 1964 when the present all-brass format was adopted and we became the Drogheda Brass Band. The band has served the town for over 126 continuous years and has performed at all the major civic occasions in the town during that time. These include visits of leaders of our independence movement, prominent politicians, Presidents of Ireland, Cardinals and other leading churchmen. We played at the funeral of Mother Mary Martin – a patron of the band and founder of the Medical Missionaries of Mary based in Drogheda. Particularly memorable was our performance for Pope John Paul II when he visited Drogheda in 1979. The band has also been to the forefront of the civic life in the town - the St. Patrick’s Day Parade, Parish Nights Variety Shows, Drogheda Pantomime Society and Drogheda Horse Show were all founded or co-founded by the band. In addition to appearing at civic and community events, ensembles from our senior and youth bands perform in local schools, and we run our own annual concert series where our guest artists have included the Dublin Welsh Male Voice Choir and the world-renowned piano and violin duo, Una and Fionnuala Hunt. The band also performs in local parks and gives carol recitals in the town centre at Christmas. It is a long-standing tradition for members to play carols in the local hospitals on Christmas Morning. We have represented the town with distinction on many occasions throughout Ireland and abroad, most notably in July 2006 when we performed at Aras an Uachtarain for President McAleese. Other prominent occasions include two President Carter Friendship Force exchange trips to the USA in 1977 and 1979. We also played at the European Brass Band Championships in 2000 and 2009 and appeared as National Champions in the National Concert Hall, Dublin, in 1987. The band has made numerous appearances on RTE television and radio. We were featured in the 1970s TV series “Country Brass”, and appeared twice on the Late Late Show – the full band and our quartet have both made separate appearances, both as National Champions, a record we believe to be unique. Several radio broadcasts have been recorded, and members have also appeared with the National Broadcasting Brass Band, on radio and in the National Concert Hall. 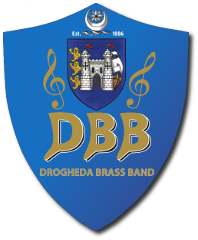 The Drogheda Brass Band is the founding member of our national association, the Irish Association of Brass and Concert Bands (IABCB), and several band members have played leading roles as Executive Officers of IABCB in the development of the band movement in Ireland. The band has a proud record of competitive success, winning its first national title in 1912, and has for many years been one of the most successful bands in Ireland. Numerous awards have been attained, including several Irish (IABCB) National Championships, Northern Ireland (NIBA) Championships, and Solo, Quartet and Ensemble Championships at regional and national level. Under the expert guidance of our current Musical Director Michael Maher, himself a former principal player with the band, we are confident of adding many more titles in the years ahead.